Thank you all so much for the warm and kind anniversary wishes. Dale and I are all verklempt, I tell you! You all really know how to make a couple feel special. Okay, don’t fall over or anything, but I actually have knitting to show you today. You see, once I had that Heads Up yarn wound into a cake it started screaming really loudly, “knit me! knit me!” That yelling was just the inspiration I needed to finish the Lavender Mint socks. Like the Heads Up, this is also Scout’s yarn and the colors of lavender, green and white are so spring like! They are my standard picot edge stockinette sock. I honestly never get tired of knitting this plain ole sock. How could I? They fit perfectly and they are simply beautiful. When Julie heard I was knitting socks in this colorway she sent me some of her Lavender Mint Tea and I drank many glasses of iced tea made from Julie’s special blend while I knit these socks. It was a perfect combination! Kudos to Scout for the yarn. Kudos to Julie for the refreshment. Kudos to a new pair of socks for the sock drawer. That sounds like a great knitting and tea combo! Kudos to you for finishing the socks (they are beautiful) before starting the next pair! those are cute socks. i like the colors a lot. Cool socks! I like how there is a fraternal flash on the insteps! I love those little narrow stripes. Your socks are beautiful! I like “plain ole socks” as well. And a belated happy anniversary to you and Dale! Beautiful socks! Love the colors, especially…and that pattern? It’s my favorite, too! I have a pair OTN right now, trying to finish before Summer of Socks 08! So pretty! And I really like the stripe across the instep. No, really — I know this is supposed to be a drawback of self-striping/multicolored sock yarn, but I think it looks cool. Where was I yesterday??? Happy Anniversary!! I love revisiting B&Bs — there’s one in Seaview, WA, with my name on the door. ; ) Glad you had a great time. 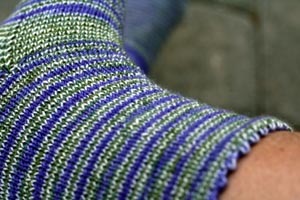 Ooh, how cool would it be to tuck a lavender sachet into the cuff of one of these socks? Then lavender scent would waft up to you…a total lavender experience. Yum! 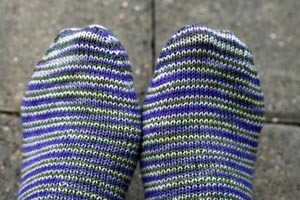 Ooh, how cool would it be to tuck a lavender sachet into the cuff of one of these socks when they are in the drawer. Then lavender scent would waft up to you…a total lavender experience. Yum! I love the colors in those socks. They are so pretty. How nice to sip on Lavender Mint tea while knitting…those socks are lovely! Oh, one of my fav color combos!!! Gorgeous simplicity! A plain ole sock is the best way to show off gorgeous sock yarn like this. Very pretty! So pretty! And what a perfect fit. They look so comfy and colorful! I love that almost-stripe thing you’ve got going on! Lovely! Someday – when you have time, can you point me in the direction of the instructions for you lovley picot edge?? Pretty please?? lovely socks – Scout’s colors are so pretty. they’re top down right? do they tend to slouch a bit when wearing?? (since there’s no ribbing) they just are soooo purdy! And with that lovely yarn, it’d be very entertaining to knit. Great colors and I find a nice stockinette sock is always the perfect thing. The socks are just beautiful! But, of course, I’m going to love them – they are lavender! Congrats on your anniversary – Sounds like you both had a wonderful time…and the place you stayed was very pretty…Many more wonderful years together!!! yummy colors! i always love your plain socks with a picot edge. Ooh, I love the skinny stripes and minty colors! Beautiful socks!! I love the yarn. They remind me of crocus in the spring. Another stunning pair to add to your already amazing sock drawer. ATyahooDOTcom and let me know.